As a professional and consulting services firm within the ever shifting technology industry, Kenzan is trusted to consistently deliver high quality products and services. We take this expectation seriously and use the most progressive tools and approaches to ensure we meet those standards. Kenzan’s Project Management/Business Analyst (PM/BA) team is critical to our success as they support and guide the development teams through each project. Working between multiple internal and client teams, our PM/BA’s plan, consult, organize, communicate and manage a vast amount of resources and information each day. To make sure projects are meeting deadlines and teams are communicating effectively, time management and prioritization are key. Luckily, there are some techniques that can help keep the days running smoothly. The simple framework of the matrix allows for easy visualization without complicated tools; a whiteboard or corkboard will do just fine. 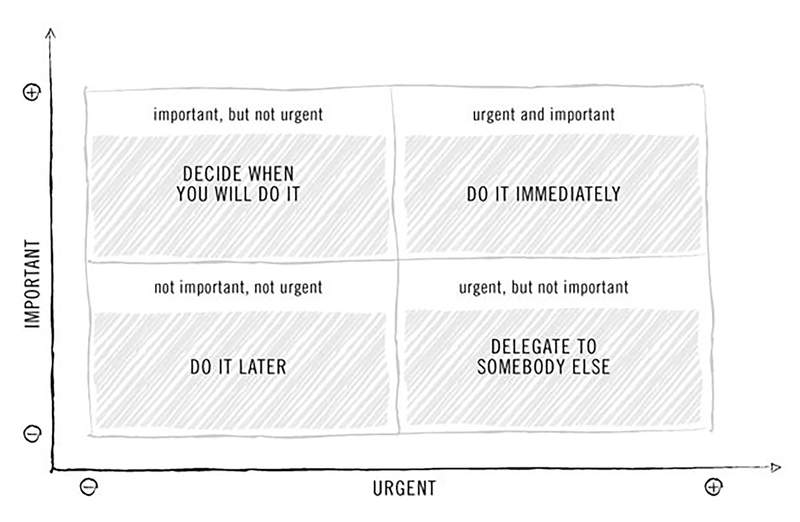 or those interested in a more portable method, Trello published a great blog post on how to use their tool to apply the Eisenhower matrix. If you’re familiar with Agile, an Information Radiator can also be used to visualize and sort tasks. Regardless of how you draw the matrix, getting all the information out of your head and organized in one place makes decision-making less arduous and your work day more productive. Instead of racing to a deadline or fighting the lure of procrastination, the Pomodoro Technique is a simple time management system that breaks the work day into intervals with short breaks designed to eliminate burn-out and fight distractions. Created in the late 1980’s by Francesco Cirillo, the approach divides each day into 25 minute work-periods — or Pomodoros — that are surrounded by short and long breaks. Short breaks are 5 minutes; long breaks are 25 minutes and are allowed only after four Pomodoros have been completed. Work should be done consistently through each Pomodoro and should stop only at break times. In a professional setting where email and IM’s are constant, it’s important not to use the break times for checking email. Instead, short breaks are good times to get up, get a glass of water or a snack. Long breaks are well spent getting some fresh air, getting lunch or just going out for a cup of coffee. There are even some tools to help keep you on track. This Google Chrome extension blocks websites until it’s time for a break. The Pomodoro Technique was named after the Italian word for tomato. It’s creator, Francesco Cirillo, was inspired by his kitchen timer, shaped like a tomato. 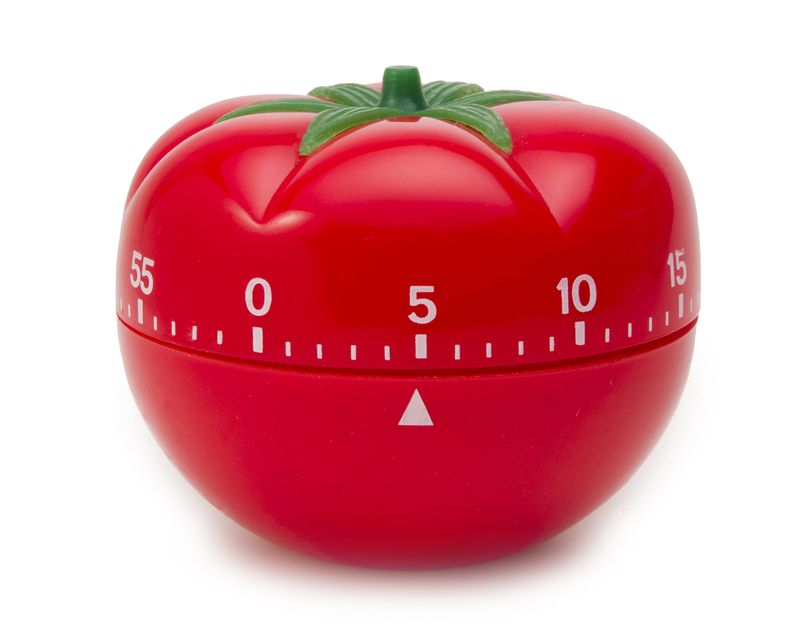 For our project managers whose goal is ensuring development teams meet deadlines and complete deliverables, the Pomodoro Technique is especially helpful for creating accurate project timelines by estimating the number of Pomodoros it will take to complete a task. While these methods can work on their own, the true magic of the Pomodoro Technique and the Eisenhower Matrix become apparent when the two systems work in conjunction. Using the Eisenhower method for decision-making and the Pomodoro Technique for execution leads to a more efficient and productive workday, while maintaining quality and consistency throughout every project. Doug Melvin is a Senior Project Manager and Business Analyst for Kenzan based out of our Denver offices. When he isn’t working, he does his best to keep his puppy out of trouble and experiments with different programming languages. At Kenzan, Doug is responsible for ensuring that development teams deliver on time and on specification, with the resources they need, and assisting with the management of Kenzan’s Atlassian suite. His background in Computer Science originally brought him to Kenzan and has enabled him to support, and interact with, the highly technically-focused platform and development projects that Kenzan engages in.